Explains that the session will focus on risks – building on earlier sessions in the day on deaths, life, disability, now RISKS. An important discussion to be had, because intervening in the realm of risks is where the potential for gain is most considerable. Introduces presenter Stephen Lim, of the Institute for Health Metrics and Evaluation, University of Washington. Limitations to data accessibility – including that for measuring exposure distributions. Geographical data is largely confined to urban regions. 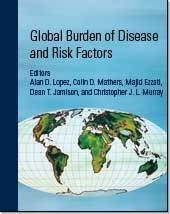 An inherent limitation of studies on GBD. Underscores the need for better data collection in the future. Important revisions compared to other risk assessments : downward revisions in child mortality, changes in cause-specific mortality, revisions in the effect sizes. Larger attributable burden = household pollution, a cause of heart disease. GBD finding: Physical inactivity represents HALF the health burden of tobacco/smoking. Highlights the importance of comparative analyses. This is in contrast to older assessments which concluded that the two were comparable. Nuanced understanding of the role of diet in preventing chronic disease. Major revisions in the quantification of the burden in micronutrient deficiencies. Evident in regional analysis: the large variation in respect to attributable burden – the leading risks in sub-Saharan Africa continue to be those associated with poverty and which primarily affect children. A succinct overview of a very complicated subject. Introduces Srinath Reddy (Public Health Foundation India) as “India’s health tsar” – “I don’t recall any assessment on NCDs in the past two decades in which he did not play a part”. A monumental study, in terms of its potential impact on policy. A demonstrable shift in the nature of risk factors. Commends Srinath for highlighting novel approaches to data disaggregation. Srinath right to point out the relevance of findings to individuals outside the health sector. Unrecorded alcohol consumption is a big issue. There is no real quantification of this. Globally, the most prominent burden on young adults. Major issue, including in Sub-Saharan Africa. Alcohol industry is an equally determined foe as the tobacco industry is. Attempts to reduce alcohol consumption will be met by the industry in a vigorous way. Big major international funders need to put money into GBD research. “I want to know the relative importance of respective causes”. Afraid of too many things being said to be relevant…e.g. pollution is very, very difficult to measure, especially compared to smoking. He therefore challenges Stephen’s conclusions owing to uncertainty re: statistics. Q. Why doesn’t paper include the socio risk factors? E.g unemployment discrimination, social isolation, inequality…? exposures and low-access risks. How does the element of uncertainty affect the policy debate – helpfully or harmfully? Emphasises the policy tractions this initiative will generate: with the tools that have been developed, the GBD 2010 will have considerable policy traction in the developing world. The challenge is to cast this substantive impact into immediate policy traction. Also includes that this work highlights an emphasis which is often neglected: we focus on the health system, on state responsibility, we continue to underscore the salience of industries outside the health sector…. But “what about the role of the individual?” How has the world of marketing and advertising influenced people to focus on one element rather than another? There is a huge complex science behind it. Individuals are crucial in translating such publications into a something that will resonate with policy makers.